Lately I have been c-r-a-v-i-n-g peanut butter! I could always get dip a spoon in a jar of peanut butter, but I wanted something else with it. I was thinking for a little bit because I wanted to come up with something different. 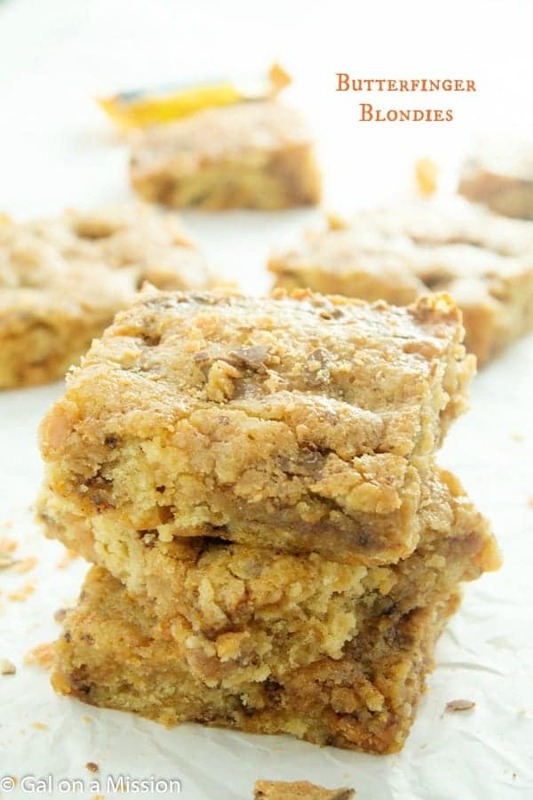 I thought blondies with peanut butter would be a brilliant idea! 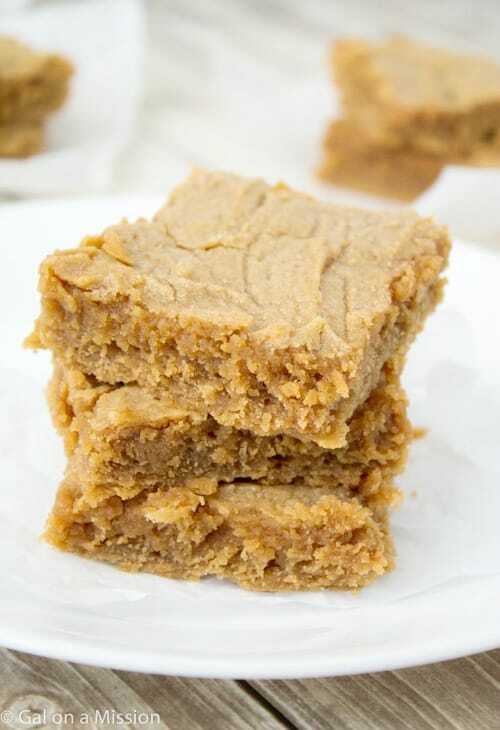 It is definitely a cross between a traditional blondie and a peanut butter cookie – absolutely delicious! 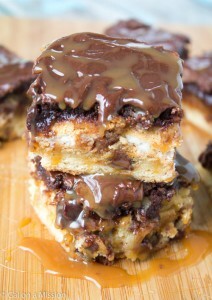 I think I might have to try this with regular fudgy brownies as well. Oh man, that just sounds amazing. Doesn’t it? I think these are great because it contains all of the rich and fudgy flavors of a blondie with a hint of a peanut butter cookie. Yum! 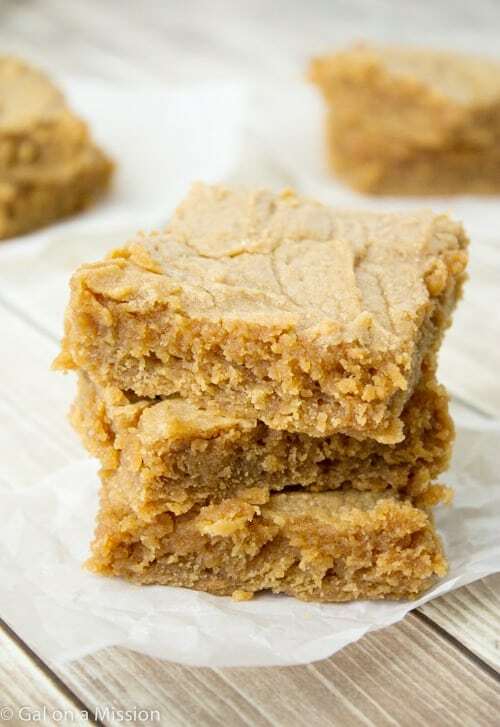 The blondie is an all-time great base recipe and you can pretty much add anything in it that you would like. I have some crazy and great ideas going through my head. To achieve a fudgy blondie you will have to use melted butter. I have tried just softened butter before, but it does not give it the fudgy, rich center. In a large bowl or a mixing bowl, combine the wet ingredients and then add in the dry ingredients. You can either use parchment paper or aluminum foil in an 8×8 baking dish sprayed with cooking oil. You then will add in the blondie mixer and bake for about 20-25 minutes. 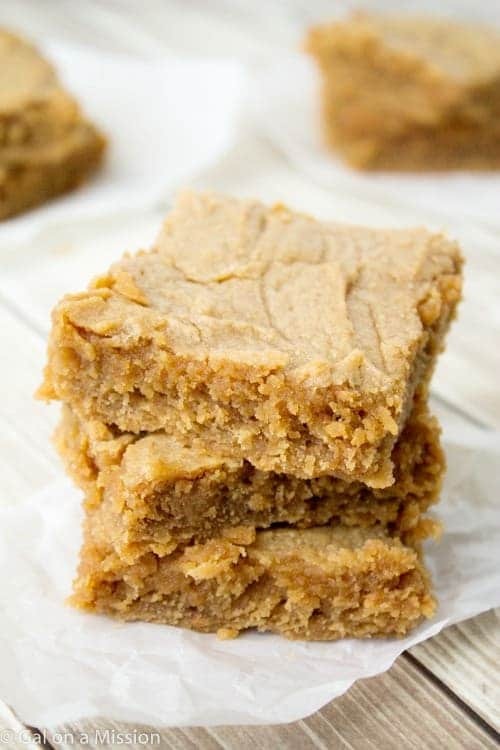 You will need to let the blondies completely cool before slicing. Add in the salt and flour. Stores in an airtight container in the refrigerator for one week. Stores in the freezer for up to 3 months. Oh this just looks delicious! I’ve never heard of this before, but my does it sound good! I really hope these bring back the taste from childhood. Thank you for sharing! Google “Lunch Lady Peanut Butter Bars” to find a recipe for the chocolate covered peanut butter bars served in school cafeterias!!! I love anything with peanut butter! These look amazing! I’m hopping by from the Eat.Create.Party! They look so good, I could eat one right now!! Visiting from I’m lovin it. Chelsea! These look so perfectly chewy soft delicious!! The peanut butter was such a great idea! I love the peanut butter idea. I’ve been looking for a good peanut butter dessert and this looks perfect. Thanks for sharing! I made these yesterday afternoon and they’re already gone! So good, thanks so much for sharing. I did add a half cup of mini chocolate chips and had to bake them for about 35 minutes–but that might just be my whacky oven. Susannah – I am so glad you enjoyed them! Love the addition of the chocolate chips – yum! 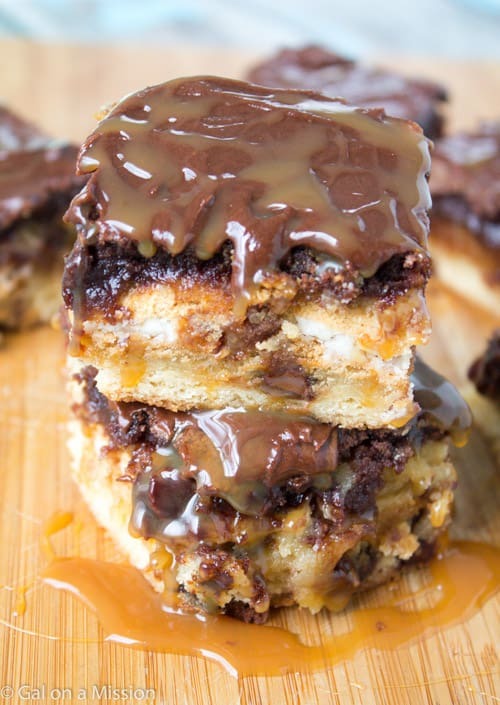 Oh yum, these look decadent and delicious! Hello i would like to try this recipe but i wanted to know if i could make this in a 13×9 pan? Would i have to make any alterations if so? Doubled the recipe (except the sugar, left that at one cup) and baked in a 13 x 9 for 22 minutes. Came out perfect!!! Thank you! So glad to hear that, Airy! I love peanut butter! I’ve pinned this to make later. Thanks for sharing! Oh yea, I’m totally all over these little gems, Chelsea! Peanut butter, NOMZ! These look delicious! I’m a sucker for bar cookies and anything peanut butter, so I know we would love them! What a fabulous peanut butter treat! Thanks for linking up with What’s Cookin’ Wednesday! Thank you so much for including me, Cathy! Any who I have something resembling a blondie or a cookie or something in my oven…My sister says ‘hey if you don’t spit it out it’s all good’…maybe this is the time to adopt a little bit more of that attitude. These look great! Will be making them for tomorrow’s potluck. Always looking for yummy desserts that don’t contain chocolate! Hope you all enjoyed them, Jennifer! They do not last very long here! Hi Danielle! They are supposed to be gooey and fudgy in the center, almost like a brownie! This batter seems a little thick. Normal? If I do not have unsalted butter and just use regular butter should I cut out the salt in the recipe? Can you use dark brown sugar instead of light brown sugar? Just made these! They are cooling in the kitchen right now! I used crunchy peanut butter and put some chocolate chips in them! I couldn’t resist! I may have to make a batch with crunchy peanut butter. Luckily they will be all mine because the hubby doesn’t like crunchy. YES! Got these in the oven right now!! Filled the recipe exactly BUT I did add chocolate chips at the request of my hubby 🙂 can’t wait to try them!! Hi- What type of peanut butter do you recomment? Natural that has to be mixed or somthing like Skippy/Jiff? Great question, Sue! I normally use Skippy. It’s one of my favorites. I just tried this recipe, and it is amazing! The brownies are not overly sweet, and it was easy. Thank you, Gal on a Mission! Great question, Salena. 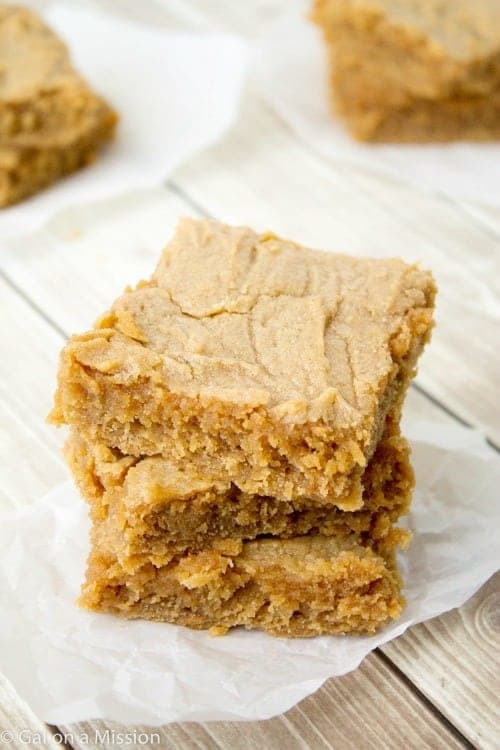 I haven’t made these blondies in a long time. I would say maybe once they are completely cooled. Let me know how it turns out if you give it a try! One word….. Incredible!! I just made these…. Doubled the recipe and baked then in a 13×9 pan. Added peanut butter frosting made with peanut butter, confectioners sugar and a little hot water!! We love peanut butter and these were exactly what I was looking for. Chewy moist peanut butter deliciousness! Made them tonight! Drizzled with chocolate then crumbled bacon over top! Amazing!! I have a batch in the oven right now. I sure hope they live up to my expectations. I will report back shortly. OK, They definitely live up to my expectations. They are very tender and moist/fudgy. I will put some PB flavoring in them next time. I really like PB flavor. Great recipe!! 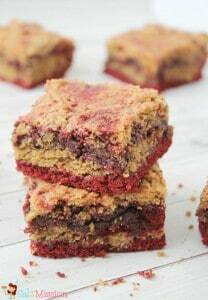 I literally just made these, but also added chocolate chips and pecans. Amazing and addictive!!!! I’m so glad I found your recipe! Doubled the recipe and put in a 9 x 13 pan and baked for about 37 minutes. Used chunky pb. PERFECTION!!! I love how easy and quick this recipe is. Thanks so much, this one’s a keeper.